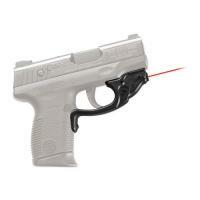 Crimson Trace LG-493 LG-493 Laser Guard For Taurus Millennium Pro (No Rail) FREE SHIPPING! Crimson Trace LG-493 Laser Guard for Taurus Millennium Pro (No Rail) maintains a design that leaves the profile of the firearm virtually unaltered, hence user handling adjustments need not be made. The LG-493 is a marksman's dream as it remains unaffected by recoil and is factory sighted at fifty feet. Crimson Trace's LG-493 has an activation mechanism that is instinctive, so the draw, whether it is from the pocket or a holster, remains unchanged. The battery runtime of this laser guard can be relied upon at four plus hours, and windage and elevation is no challenge as the user can adjust for it. The Crimson Trace LG-493 guard makes for the perfect laser companion to the Millennium Pro version of the Taurus firearm. ***For Taurus MP's WITHOUT RAIL ONLY!! ©2002-2019 CopsPlus.com: Crimson Trace LG-493 LG-493 Laser Guard For Taurus Millennium Pro (No Rail) FREE SHIPPING!